In 2011, PFF’s Sam Monson identified the leagues prototypes for each defensive line technique. Fast forward to 2017, and defensive fronts have changed dramatically along with the types of players NFL teams are searching for as positional prototypes. Today, we examine the updated version, so-to-speak, on how the classic defensive line techniques have changed and who the current prototype is for each alignment. While their may be variances or more nuances to the naming system for each technique, we will use the defensive line numbering system below as a reference. Essentially, the numbering begins from head up over the center, and works its way outward in either direction. Each shade along the way will receive its own number or contain an ‘i’ modifier, which stands for “inside”. Moving across the front you will see that even numbers are head up alignments, odd numbers are outside shaded alignments and those containing an ‘i’ are traditionally shading just inside. The 0-technique, also called the Nose Tackle (NT), plays directly over the center or “head-up” on him. The 0-Tech is generally responsible for defending both gaps between the center and the guard (A-gaps) and is most often used in a 3-4 defensive front. His main job is to shut the run game down from pushing directly up the middle. To do this, he must control the center while often drawing a double team from either guard. That is why the heaviest players in the NFL typically play NT in the 3-4 front. They use a combination of their massive size and strength to anchor and win against blockers at the point of attack. Harrison stands 6-foot-3 and over 340 pounds, and uses every bit of that size to dominate the run game. Dominate isn’t overselling it either as no interior defender has been more destructive against the run since he entered the league in 2012. During that time, he leads all interior defenders in run stops (166) and run-stop percentage (14.9 percent). That career run-stop rate would have led the league by a distance among all defensive tackles in 2016, and in fact every other year of the past decade. The 0-technique spot doesn’t typically generate large amounts of pressure on the quarterback, but with more hybrid single gap 3-4 fronts being utilized these days, you will find coordinators using smaller, explosive players to shoot one of the A-gaps and get to the quarterback quickly, particularly in sub packages. New England has recently done this with Trey Flowers in passing situations who racked up 18 pressures rushing from 0-tech last season which was almost double the next closest defender. The 1-technique is also referred to as Nose Tackle, and is very similar to 0-technique in that they both play over the center. The defining difference between the two, is the 1-technique shades over one of the shoulders of the center and usually is responsible for just one gap. The 1-technique, like the 0-tech, is expected to take on double teams from the center and guard which produces one-on-one matchups for the rest of the defensive line, allowing them to attack the backfield. The difference is that this alignment has been most often used with a 4-3 front. From 2012 to 2015, we saw Harrison establish him as the prototype 0-tech and after switching teams in 2016, Harrison established himself as the prototype 1-tech as well. Whatever defensive front you run, Damon Harrison is the nose tackle you want in the middle of it. 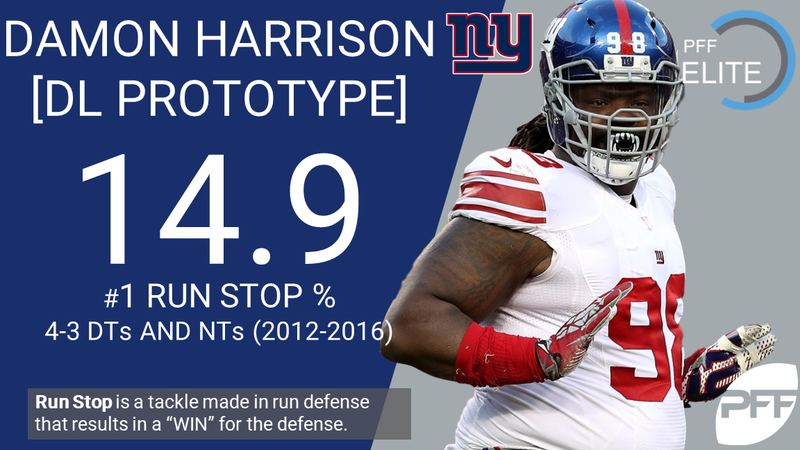 Harrison is that good, and in his first year as a 1-tech he racked up ten more run stops than the next closest interior defender, while also leading the league in run-stop percentage at 15.8. A good 1-technique can make the lives of the entire defensive front seven easier, so it is no surprise to see the Giants defense elevate their play the way they did last season. Arguably, the most well-known alignment technique is 3-tech. 3-technique is the premier interior pass-rushing alignment in every defense. While 4-3 defenses feature a player aligned in a 3-technique on most snaps, even 3-4 defenses use the alignment on most passing downs in today’s NFL. Unlike the nose tackle, this alignment was designed to put the 3-tech one on one with an offensive lineman, allowing him to attack the B-gap (between guard and tackle), and the position’s success is predicated almost entirely on penetration. Whether defending the run or rushing the passer the 3-technique’s focus is to wreak havoc in the backfield. Typically, the most athletic defensive interior players play this spot on passing downs regardless of their alignment on base downs. When thinking about a prototypical 3-technique, think Aaron Donald who is 6-foot-1 and roughly 285 pounds. In a short time, Donald has changed how the league defines a “prototype” 3-technique, shaving weight and size from the previous standards in favor of speed, quickness and leverage. Donald is a bit smaller compared to former successful 3-techniques but significantly more athletic. 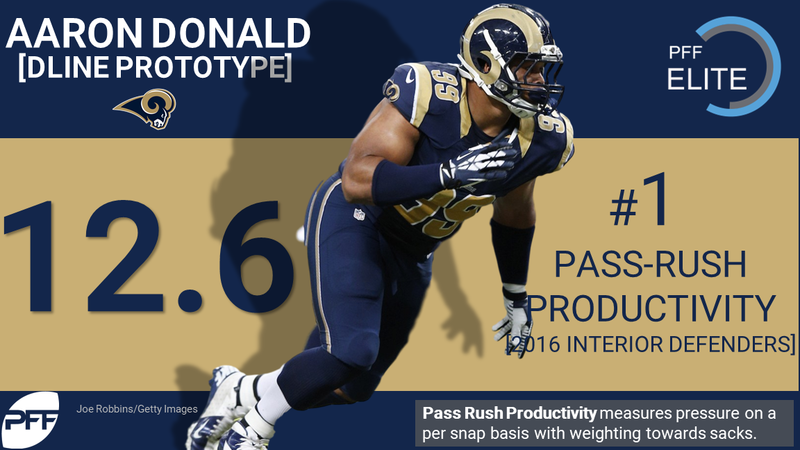 Donald’s production on the field is dragging the league’s standards for the position in his direction. Since entering the league, no 3-tech has been more effective against the run or the pass. His career run stop percentage of 11.0 percent is the best among 3-techniques in that span and he has led his position in pass-rush productivity in each of the past two seasons. Over the past few seasons, arguably no position in football has changed more than the 3-4 defensive end spot. With multiple-front defenses becoming more popular, combined with the fact that nickel defense has become the new base, 3-4 DEs find themselves playing all over the defensive front. In its most traditional form, much like the 0-technique, the position was a two-gap player, lining up directly over the offensive tackle and being responsible for the B and C gaps on his side of the formation. These players are typically long and stout with a skill set that allows them to stack big offensive tackles and shed them in order to make a play on the ball carrier. As the league has developed into more of a pass-happy landscape, so the position has developed into one that plays the pass first and run second, and the amount of two-gapping done in today’s league is a fraction of what it was ten or more years ago. These defensive ends are moved around across multiple techniques and are far more likely to be operating in one gap and looking to penetrate into the backfield. 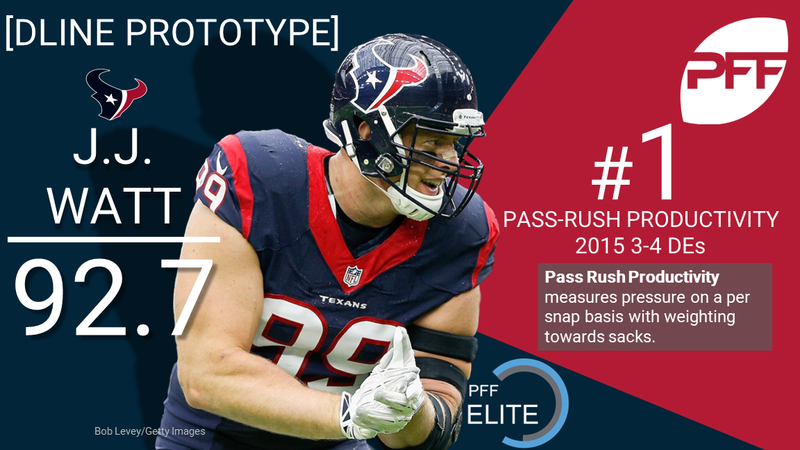 The prototype 3-4 DE is easily J.J Watt. He is both long at 6-foot-5 with 34-inch arms, and heavier than a 4-3 DE at 295 pounds, which allows him to play the traditional 5-technique position, holding his gap on run downs. In sub packages, Watt moves all over the front playing both on the edge and inside at 3-technique. This is common among the league’s best 3-4 DEs. In Watt’s last full year of action, he led the league among 3-4 DEs in run stops (37) and in pass-rush productivity (12.4). Another area the NFL has changed is the way defensive coordinators try to get pressure on the quarterback. In the past, the league’s best pass rushers rushed from the right side, the quarterbacks “blind side”. Thus, the 7-technique was often used by teams that run a 4-3 on the left side of the defense as the run-stuffing, power end and in some fronts, was referred to as the “Closed End”. This player lined up in the gap between the right tackle and tight end, or head up on a tight end (6-tech) and was considered the edge-setter in the run game. This player had to be big and strong enough to stuff the run but athletic enough to beat the right tackle to cause pressure. While this is still certainly true for some defenses in today’s NFL, offenses are far more balanced now, and right tackles have to deal with just as many of the league’s most fearsome pass rushers as their blindside counterparts. In fact, most of the league’s most devastating pass rushers are seen weekly going against right tackles one-on-one. Khalil Mack is the prototype for the new take on the position. 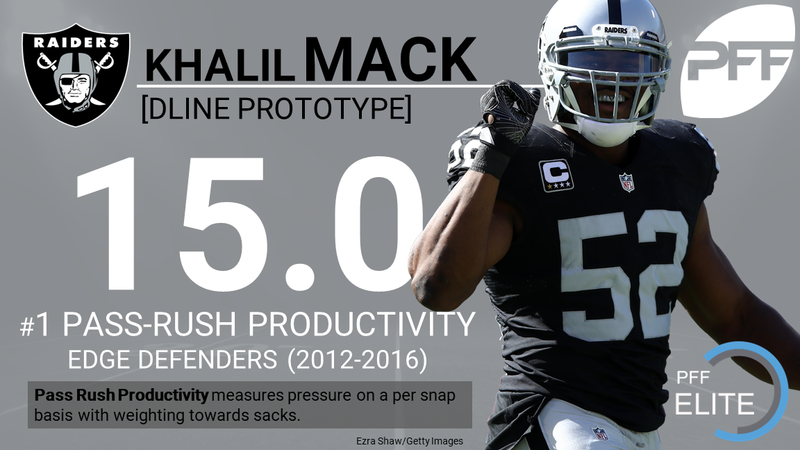 In 2016, Mack lead the league in pass-rush productivity at 15.0 and while he is smaller in stature than 6/7-techniques of past, he is athletic enough to make a major impact in the run game. His 32 run stops ranked third among all edge defenders. The 9-technique is primarily a pass-rush specialized alignment and is only used outside of those confines by a handful of teams. Players lined up in 9-technique are far outside of the offensive tackle and rely heavily on speed and bend to crush the edge. With no blockers near the 9-technique they are able to hit full speed before either making a distinctive move or using a low center of gravity to bend the edge flying by the offensive tackle. In many cases, the offensive tackle will anticipate the speed rush and over commit to the outside making themselves susceptible for an inside counter move. It is a technique that comes in and out of vogue in the NFL, because all of that extra width opens up significant space along the line that can be exploited by the offense. 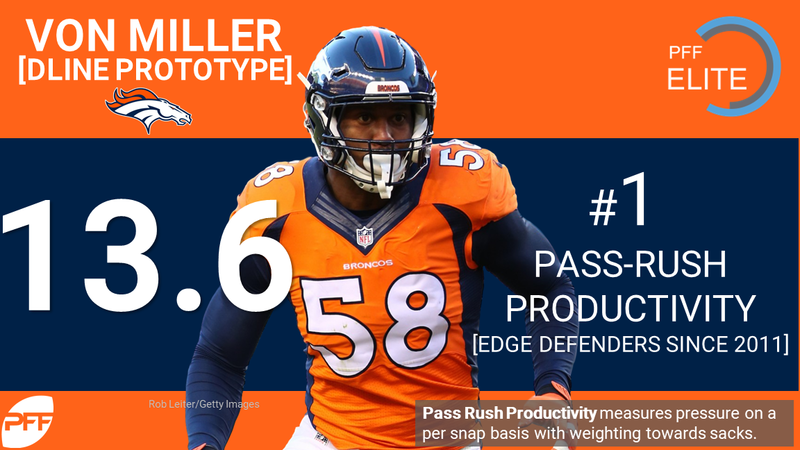 Von Miller can play in any edge technique, but he is the leagues prototypical rusher from the 9-technique. Miller uses a variety of moves to beat opposing offensive tackles but one that sticks out is his bull-rush. Miller will use his speed to get the offensive tackles feet moving and then devastate them converting his speed to a powerful bull-rush. Almost 28 percent of Miller’s 79 pressures in 2016 came from the bull-rush. This number is substantially higher than other elite pass rushers like Mack (16 percent), Jordan (15 percent)) and Olivier Vernon (eight percent).